Parenting is the beautiful journey and it transforms you to completely different person. I would say, it was great learning at every stage of my kid’s growth. Actually, every child is different and both my kids are the total opposite of each other, so I have to use two different parenting styles in their upbringing. Over the period of the last 9 years, I have evolved as a person as a mother in a fantastic way and I’m grateful to my kids for this transition. Parenting needs lots of patience, strength, positive attitude as there are many times when you get exhausted, depressed, tensed, irritated, helpless, sad. But, remember one thing, it’s for a while and shall pass soon. You can make your journey more delightful with some tricks and tips for sure. I have a secret set of mantras for parenting and it has helped me always. Believe me, it works like a magic and I feel like supermom. I take nap with both the kids on every weekend and public holiday(read it – as and when possible). It’s a must ritual for all of us. All three of us are on toes for the complete week as they have their school, activity classes, playground time and studies. And thus we have reserved our weekend afternoons for only relaxing and resting. This afternoon nap helps us to get refreshed and ready for the new week. It sounds really funny, but it’s the fact. I cook tricky meals – which have vegetables and fruits mostly. It has vegetables stuffed parathas, patties, sandwiches, vegetable rice. Unknowingly kids finish their meals and get their nutrition as well. And we have desserts made using, topped with only and only fruits. It not only provides complete nutrition to kids but also saves my cooking efforts. Most of the time when we go out my younger daughter throws worst tantrums. The tantrum might be for anything, anywhere and she cries in loudest possible pitch. Sometimes she cries because of hunger, fatigue, thirst but most of the time it is forgetting something from the market. I hug her tightly and try to calm her. I used this same mantra for my elder one until she got 5 years old. Thankfully she stopped her tantrums after that. My kids follow my actions most of the time. So I have taken advantage of this thing and started doing things which I want them to do. Like I read books with them, eat with them, play with them and most important I don’t give time to any kind of screen. They imitate me and do these things but still love to watch cartoons. I wish to control it. So, it was all about my magic parenting mantras. I’m sure every mom has her own parenting mantras. What are yours? 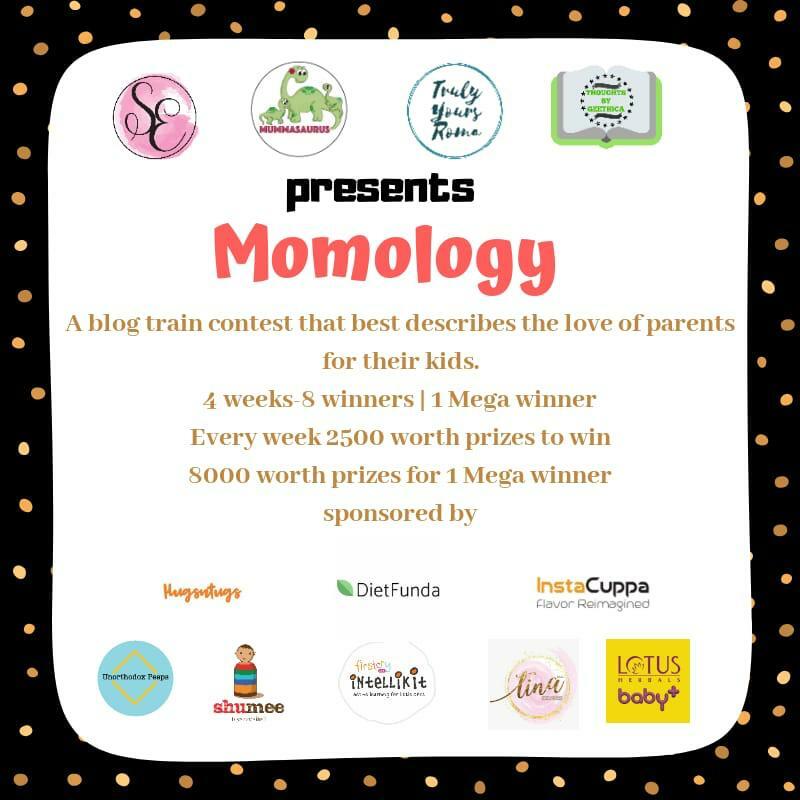 Sponsored by FirstCry Intellikit, Instacuppa, Diet Funda, Hugs n tugs, Tina Basu, Unorthodoxpeeps, Lotus Herbals baby and Shumee toys. I need to learn to take afternoon naps. I am very at taking naps. My elder one doesn’t take one but my son still needs one night. So me and my daughter utilizes this time to do something together while my son sleeps. Actually, my kids are also not interested in taking naps, but every time somehow we convince them. They wake up very fresh and happy. Thanks for visit Alpana.. Exactly, we can use storytelling as a power tool. Thanks for reading Surbhi. Thanks for reading and sweet words princy. It’s good to know that you could relate to it. Thanks for visit Gunjan. Its good that you could relate to me. Thanks sonal. I love the idea of joint afternoon naps. I am going to try this. Aesha it is fun plus relaxation.. thanks for visit.